If you decide to climb a wind turbine, let me suggest something. 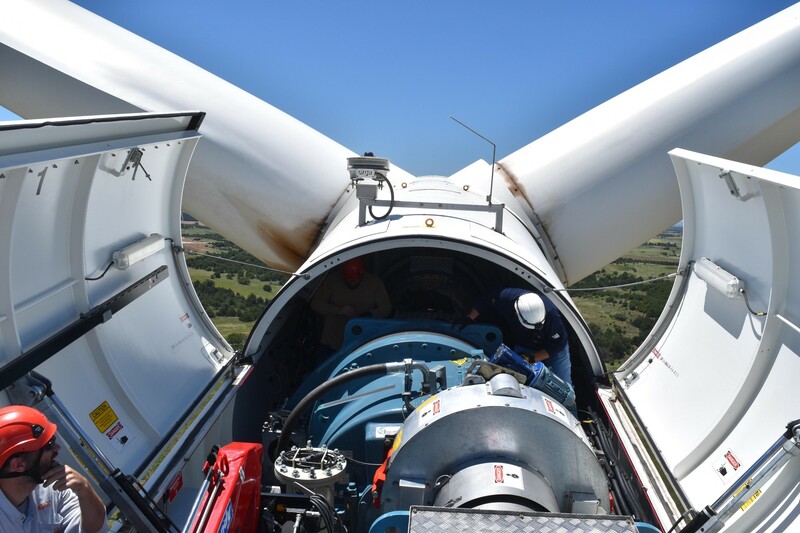 Do not climb a wind turbine in the July heat of Oklahoma. Perhaps you might prefer something along the Columbia River Gorge in October? Ah well. 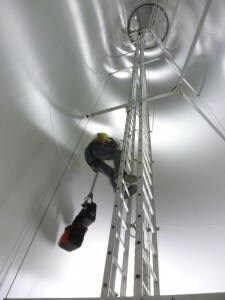 When I decided that I wanted to see what it was like inside and atop a wind turbine, I didn’t have a choice. So, I found myself sweating in 105 degree humidity inside a windowless tapered steel tube as high as a twenty five story building. I was wearing a long-sleeved fire-retardant shirt, blue jeans and ten pounds of harness. I am 44 years old. The only way up is a vertical metal ladder. Hand over hand, step after step, you climb upwards. When the wind industry began to take off in the United States — mid 2000s — the metal ladder was usually all there was. The machinery was housed at the top, so if your job was to service the machinery, up you climbed. Today, things are typically a little better. There is something called “climb assist.” It is a rope that you attach to your harness and it pulls you up, taking 75 pounds off your weight. For the first, short climb up to the first deck, I clipped on. At the first deck, I turned to one of my guides — an affable 28-year-old named Dustin who was 6' 5" and bore a striking resemblance to a young Hodor from Game of Thrones — and said I’d like to free climb the section without climb assist. This wasn’t mere machismo. (Partly, I’m sure, but not wholly.) A lot of turbines don’t have any climbing aids. Workers climb them all the time. And my other guide, James, had scampered up the ladder. Surely I could manage one climb and see what it’s like for many wind technicians. After all, the fastest growing job in the United States is what’s known as a wind tech. People are flocking to these jobs, keeping the giant power generators working. They climb up and down turbines all day, every day. Surely a middle-aged writer could manage one climb. This isn’t a photo of me, or one that I took. I didn’t trust my arms to fish out my camera from a velcro-sealed bag slung over my shoulder. At the second deck, I informed Hodor between deep inhalations that I was planning to use the climb assist again. I grabbed the rope and started to thread it through the triangular clasp. The rope slipped out of my fingers and wedged itself into the rail where my safety harness attached. No amount of jamming fingers in could dislodge it. The Siemens nacelle — the large box that holds the gearbox, spinning shaft and inductor generator — has one enormous advantage over its competitors. It’s a convertible. The top of the nacelle opens in two sections. And you have a penthouse view of Oklahoma red dirt and rolling terrain for sixty miles. The view could be described as breathtaking, except that the climb had already taken my breath away. My legs were still wobbly. I attacked a bottle of water. The wind was blowing from the south at 17 miles an hour. James was leaning against one of the open bay doors. He asks me what I think. It’s nice, I respond. “A lot of guys say they have the best job. Look at this. What a place to go to work,” he says. He’s been to Washington State, Maine and the Dakotas servicing turbines and training workers. For a couple of years, I worked on the 50th floor of Renaissance Tower in Dallas. You could press your face on the floor-to-ceiling windows and look down. This was nothing like that. There are no neighboring skyscrapers. You are in the air and everything you can see is hunkered on the ground below. And you are slowly swaying, you and a few million dollars worth of gearboxes and shafts and lubricants and blades. We stayed up on top of the turbine for an hour. Fairly quickly, my legs began to feel strong again. At the urging of Dustin and James, I clipped on and climbed up on the “whale tail.” That’s the fin in the back, which holds meteorological equipment. I stood up there, 285 feet above the ground, looking out toward the horizon. No great epiphanies came to me, or insights into the future of energy. All I can tell you is that if you have the opportunity to climb a wind turbine, take it. In Washington State. I interview people. I write books. Superpower is latest (buy it! https://bit.ly/2C3IXWZ). It’s about energy, not Clark Kent. I write for Wall Street Journal.